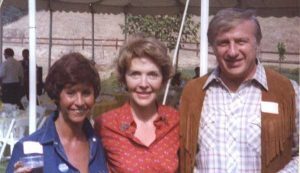 News of former first lady Nancy Reagan’s death on Sunday brought back memories for a Palm Beach couple who were friends with the Reagans before and during their years in the White House. Seymour and Evelyn Holtzman have several photographs of themselves with the Reagans, including some taken at a state dinner, at the Reagans’ ranch in California and in the backyard of the Holtzmans’ home in Kingston, Penn. The Holtzmans also were among a few friends who waited in the Rose Garden for President Reagan when he returned to the White House on Marine One after being treated in the hospital following an assassination attempt in 1981. Seymour Holtzman is a business executive. The couple is from the Wilkes-Barre, Penn., area but have lived since 2003 in Palm Beach, where they have a home on Chilean Avenue. The Holtzmans met the Reagans in 1976 through their son, Marc, a passionate supporter who at age 16 wrote a $50 check to the Reagan campaign. Reagan later appointed Marc Holtzman executive director of his 1980 presidential campaign in Pennsylvania. Marc left college at age 19 to take the job, becoming the youngest person to run a statewide campaign in a presidential election. After Reagan was elected, Marc Holtzman was named executive director of Citizens for America, Reagan’s national issues advocacy group. “I chartered my plane to them on several occasions during the campaign,” Mr. Holtzman said. The Reagans asked the Holtzmans to the White House many times during the 1980s, and, on at least one occasion, invited them to share the president’s box at the Kennedy Center for the Performing Arts. The Reagans were unable to attend that night, but the Holtzmans were thrilled to meet Elizabeth Taylor following her performance in The Little Foxes. Evelyn Holtzman said she was drawn to Ronald Reagan because of “the hope” he offered to the country during a trying time in its history. Seymour Holtzman called Nancy Reagan a standout among first ladies because of her campaign against illegal drug use and because of her combination of strength and grace. “She was just a nice person and a good friend.” he said.